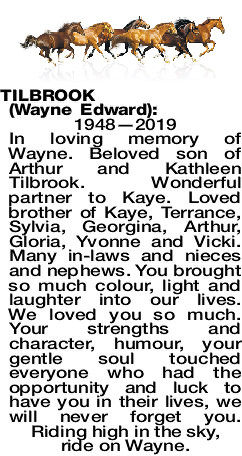 1948—2019 In loving memory of Wayne. Beloved son of Arthur and Kathleen Tilbrook. Wonderful partner to Kaye. Loved brother of Kaye, Terrance, Sylvia, Georgina, Arthur, Gloria, Yvonne and Vicki. Many in-laws and nieces and nephews. You brought so much colour, light and laughter into our lives. We loved you so much. Your strengths and character, humour, your gentle soul touched everyone who had the opportunity and luck to have you in their lives, we will never forget you. Riding high in the sky, ride on Wayne.